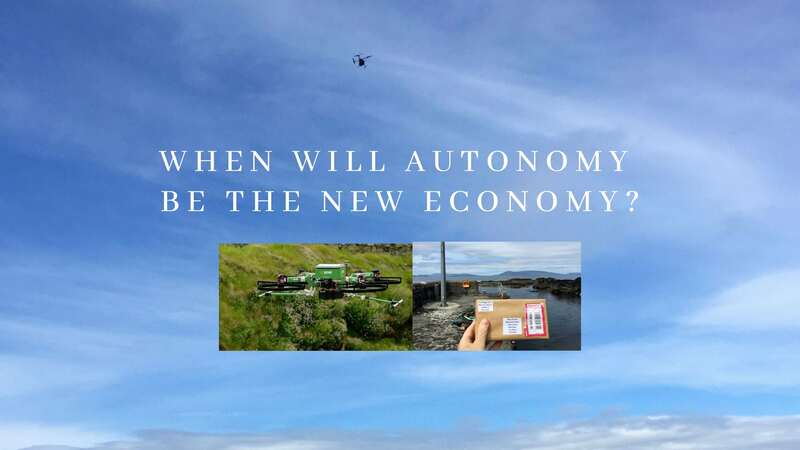 When Will Autonomy Be The New Economy? The first autonomous drone parcel delivery in Ireland and the team behind it. 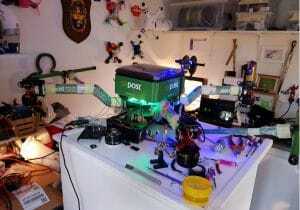 I was contacted in 2017 by the Irish National Postal Service, An Post, because their innovation people wanted to know more about drones – specifically autonomous deliveries. At that time they wanted to demonstrate to their internal teams what might be possible with drone technology in the future. Their suggestion was to fly from one side of a large An Post distribution centre to the other. The project never got off the ground so to speak – but it got everyone thinking. Almost a year later I was contacted again, this time by their marketing team and they wanted to make a video that talked about the future of parcel deliveries for the communities they serve. This time, they asked if we could fly a drone from the Irish mainland to an Island about 5km off the coast. Ireland is a small country, and you can already get a letter or package anywhere overnight, but there are islands and remote places that might one day be best served with drones and this was to be the theme of the video. This was a project that was primarily a PR stunt but not singularly PR as it also had elements of R & D. And therein lies the rub. Marketing requires quick results and R&D requires failure, time and money. But we explored the possibilities. 1. We are an authority on drone operations and knew the people we needed to pull together for a project of this nature. 2. This was a project that needed to be compliant in its execution and it’s what Skytango is about. 3. We know how to make videos and the value of PR. 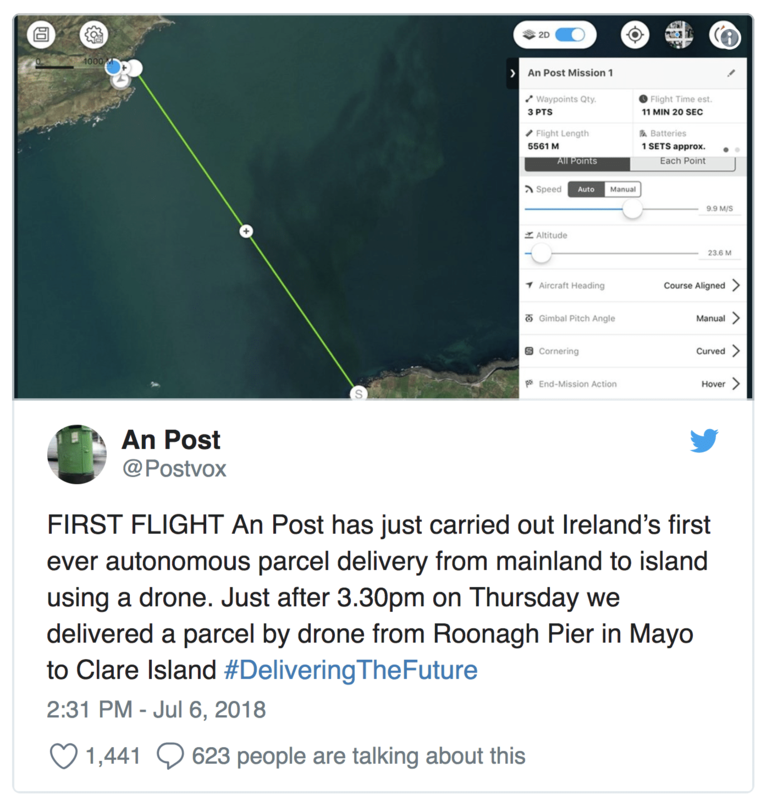 With that in mind, we settled on an Island off the coast of Co. Mayo as the destination for Ireland’s first parcel delivery by drone. 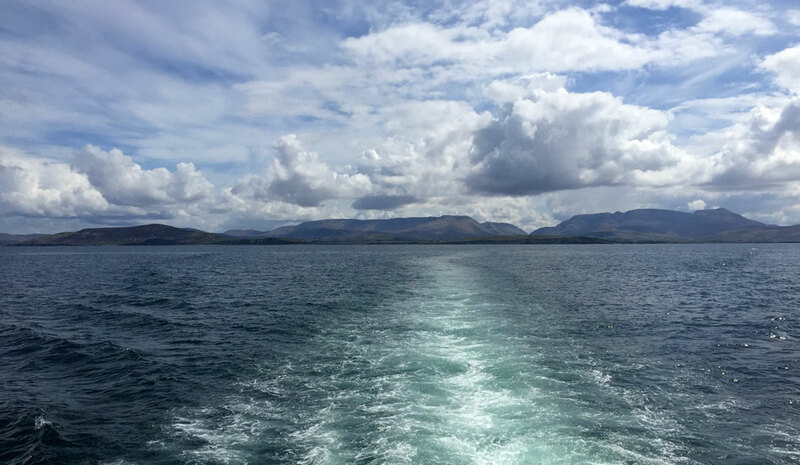 But before we accepted the challenge, we traveled to County Mayo and did a recce of Roonagh pier and Clare Island and located suitable launch and landing sites. From a compliance perspective, the airspace is Class G – unrestricted for drone use up to 400 feet and it is not over a congested area. There are no roads or people out at sea to fly over. We had the co-operation of the Coast Guard, the Clare Island Ferry Company and Mayo County Council. In our view, there was no obvious requirement to involve the Aviation Authority because of location and methodology. So after some deliberation, we accepted the challenge and told An Post that we could make their promotional video as well as get the drone across autonomously, staying within rules, regulations and insurance restrictions. It all had to be done by the book. The plan we devised was simple -make sure the weather was good, put me and a heavy lift pilot in a RIB and chase the drone across the channel as it flew autonomously between waypoints, ready to take control of the rig in the event it lost its way. Using this method, we remained within 50ft of the drone and in line of sight at all times – completely within license parameters. A beyond visual line of sight – BVLOS or even an extended visual line of sight – EVLOS operation would have needed longer preparations, more personnel and the involvement of the Aviation Authority and our timeline and budget didn’t stretch that far, but we could still pull off an autonomous delivery our way. So what could go wrong? Turns out – quite a few things! Even though we really did nothing that was technically amazing (those of you immersed in the business of drones know of their capabilities), pulling it all together proved to be a lot of work and took the spirit of a whole team of people to make it happen and some of those spirits, including my own, waned toward the end. 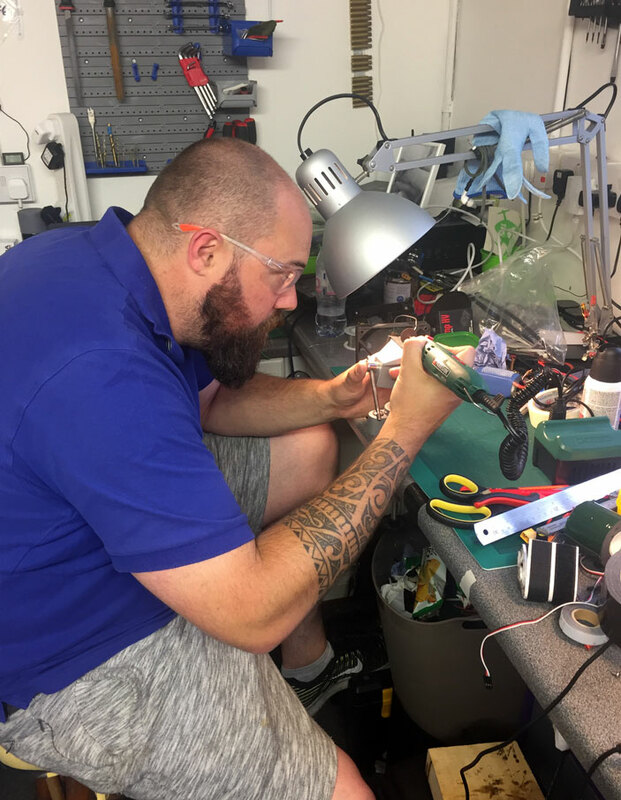 The custom drone build proved difficult under the time constraints, insurance surprises lurked because it wasn’t ‘off the shelf’ and sourcing drone parts was time consuming as most everything needed to be imported. As time marched on and deadlines were missed because of technical issues or weather, the pressure mounted. We decided to approach the project as two separate events. The first was the making of a promotional video. The second was the autonomous crossing. We had to make sure that at the very least, we had the footage to tell the story of what could be (#DeliveringTheFuture), before we sent the drone across, just in case it didn’t make the journey and ended up at the bottom of the Atlantic. We had discussed the possibility of the drone failing mid crossing with An Post from the very first meeting – there was just no margin for error or nature and to their credit, they understood the risk. But as the client, they really wanted this to succeed. We all did. So we started, full of enthusiasm. We set out to build a heavy lift, choosing a Gryphon Dynamics frame, mostly because it’s visually impressive and easy to brand. The vertical faces on the arms (rather than the carbon pipes) looked great wrapped and the Z frame also gave us the chance to seat a 3D printed box above the drone rather than below. It allowed better access for the postal operative and I had an idea of a shot where we could look down on the drone and actually see the box as it flew over the water beneath. One shot that told the whole story. Additionally, we chose a Pixhawk 2.1 controller – capable, reliable and within budget! However, in reality it proved to be a very finicky piece of kit to set up (if you dig deeper into forums this piece of information is available) and needs a lot of time to play with before it lives up to its reputation. One thing we didn’t have was a surplus of time. We stuck with it and eventually it got off the ground and seemed good. 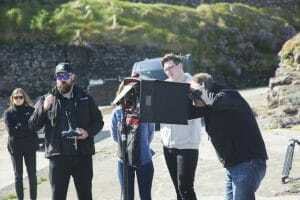 Steve wearing his director’s hat with An Post’s Richard Miley as well as Keith Tracey and Niamh Talbot in the background looking on. With the drone ready we could embark on Phase I. After several weeks of engineering and several more weeks of pre-production, our crew of 6 set off for County Mayo with the Green Machine in tow. In the production van resided a RED Dragon, a case of Prime Lenses, a custom landing pad and other props and various pieces of equipment necessary for filming. 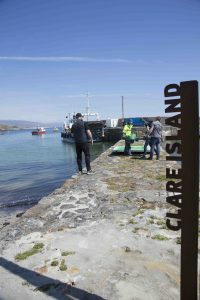 The West Coast of Ireland is breathtaking, but it’s not called the Wild Atlantic Way for nothing and Clare Island is situated smack bang in the middle, complete with its own micro climate. As we set up for the first crossing attempt over 5km of open water and measured winds at altitude on the day, we realized we had miscalculated the propulsion power necessary to make the crossing. When we ran the numbers on paper, it seemed we should have been able to get enough range and time running on the X4 with 4 U7 motors, but we very quickly realized that we had under propped the drone. Could we have made it across on what we had? Perhaps. But if we wanted the extra power margin (to be sure), we’d need to add another 22,000 milliamp battery, 4 more motors and bigger props. This weight increase posed a second problem. The original pilot, Keith, was licensed to fly up to 7.5kg. The new additions would bump the drone to circa 10kg. We would have to source another pilot licensed to fly the heavier rig. It was disappointing for us all, but in reality, we had plenty on our plate with the actual video production and that became the focus. Phase II would have to wait. Once the video production was complete, back at the bench Phase II began. Four extra motors, more batteries, bigger props and an increased gross takeoff weight meant we needed a new pilot with a different class of license. We put the feelers out in the community and found a pilot who fit the bill and was available. By this time the budget had evaporated, but determination kicked in. We made the decision to put a safety net in place. Our second pilot had just taken possession of a heavy lift drone with a DJI A3 flight controller on board which was capable of the appropriate mission planning and he very kindly offered it as a back up. It really took the pressure off knowing that everything didn’t rely on a single drone on the day. A lot of work had gone into making the green drone and it looked phenomenal. The last thing we wanted was to put it to the ultimate test over open water and see it go down – project over, no record, no delivery! We arrived at Roonagh pier a few days later on Thursday July 5th with two drones, several cameras and a RIB (Rigid Inflatable Boat). Clare Island Ferry Company, who run the ferry between Roonagh pier and Clare Island and who also own and operate the RIB, couldn’t have been more accommodating. 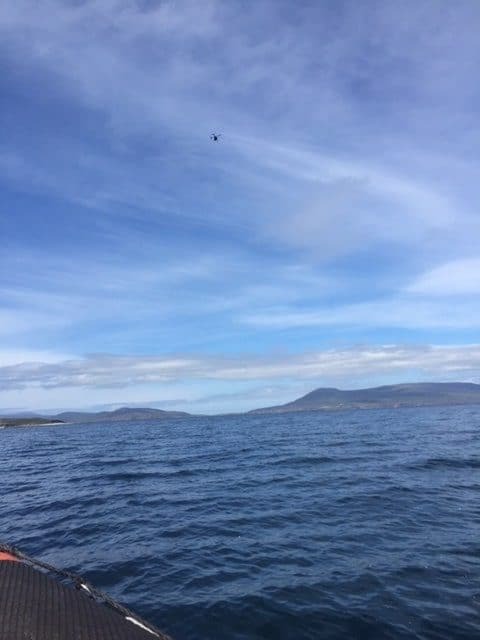 Before we did any test flights, we took the RIB ride over to the island to time the journey, test the sea state and to make sure the drone pilot could control the radio and sticks in a moving boat if it was necessary. We wanted to map the approach to the bay and secure the landing zone. We returned to Roonagh Pier to carry out another of our safety flight tests. Given the winds at altitude and our planned boat speed of 20 knots, running out of battery margin was still a possibility, so we erred on the side of caution, transferred the parcel to the larger drone and flew it across, leaving the X8 on the pier to live another day and look good for branded photo opportunities. Having planned the mission waypoints, we boarded the RIB and positioned it next to the drone on a private pier. The drone pilot started the pre-planned flight mission, and the drone climbed safely to 30 meters altitude, paused and then flew to the first preprogramed point adjacent to the RIB. From here both the drone and the RIB set off side by side towards the open water. The drone remained within 50-100m of the RIB at all times as the pre-programmed mission was set to fly at the exact speed of the RIB i.e. 10 m/s which is 20 knots – a good clip for a big drone. 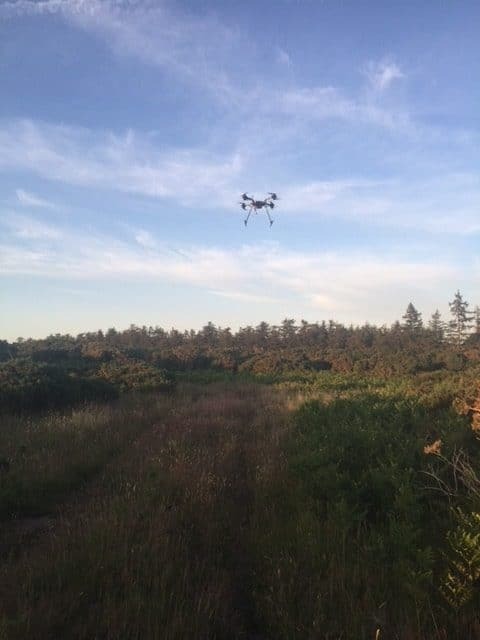 While the drone could go faster, we wanted to stay well under control and this speed ensured that both rigs were in tandem with each other and if needed, the pilot could pause, stop, speed up or slow down the drone so it wouldn’t get out ahead. A second pilot was on hand – me – as a spotter and as an emergency back up in the unlikely event something should happen to the actual pilot mid crossing and I had to press the ‘Home’ button. I got skillz 🙂 Another real consideration was our safety in the RIB. We couldn’t go any faster on the boat without risking being bounced overboard. 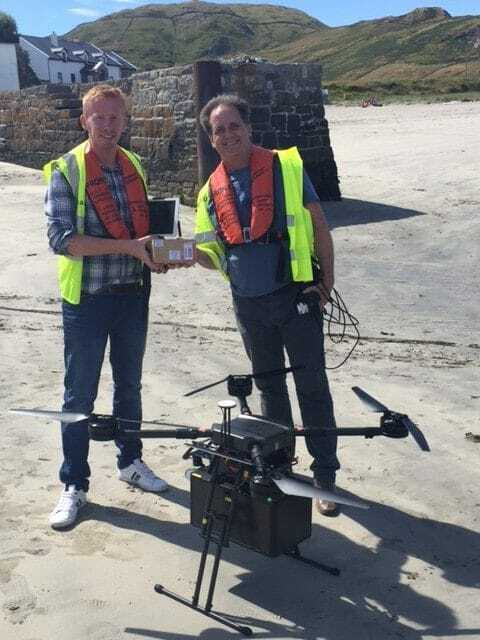 When the drone arrived at Clare Island, it came in over the bay, turned left, and was programmed to hold over the water while we made doubly sure the beach was locked down and there was no risk to anyone in the area. After we got out of the RIB, we walked to the beach and manually brought the drone in for a soft landing. One autonomous parcel delivery across 5km of open water in 11 minutes 20 secs. While it was gutsy putting a drone like that out over the sea, I think the technical achievement of this project is not the whole point. Drones have been capable of flying Waypoint missions for quite some time. There are many big companies putting millions into drone technology to do fully autonomous deliveries. I know the tremendous work going into safety and reliability – and we haven’t contributed to that R&D in any major way. But what we have done, in my view, is just as important. We broke a record, achieved the first autonomous parcel delivery in Ireland and most importantly – we started a conversation. We were able to do this without the involvement of the Aviation Authority because it was Line of Sight and tasked by responsible, licensed individuals who have been flying drones commercially in Ireland for several years, who motivated, who are not reckless, who want to see the industry advance safely and who innovated and achieved ‘a first’ – and we’re proud of that. At the end of the day, no matter who is flying these machines or how advanced the technology, drones will not achieve their potential unless we win the hearts and minds of the communities they fly over. Companies like An Post have to figure out how to integrate them into their business, and help communities accept their presence by utilizing tools that enhance safety and transparency. The fact that we were able to fly an ‘off-the-shelf’ (albeit a very expensive shelf) drone this distance autonomously is testament to how far the technology has come. That it made a few people a little nervous, is understandable. This project was designed by An Post to get attention – and do it in a way that was inspiring and hopeful for the future use of this technology. We are happy with what we achieved, and have proven what can be done with some imagination, diligence to rules and regulations, two guys, and a RIB. It was nerve racking looking at the drone out over open water with nowhere to land if it needed to get out of the air. It left me with a profound sense of what it’s actually going to take to make this a daily, regular occurrence in all types of weather. The companies and people building for that day and institutions like NASA & SESAR developing UTM (Unmanned Traffic Management) have my deepest respect and admiration. But as good as things are today, we’re nowhere near ready for prime-time and fully autonomous operations at scale are still in the R & D stages. Steve Flynn is a licensed drone pilot, an Emmy award-winning cinematographer, and CEO of Skytango (and dad to Aidan).